Pitting is the process of corrosion on the surface and into the underlying material, often metal, causing irreversible and expensive damage to pool equipment. What does Pitting in swimming pools mean? Pitting describes small deformations in a material that can form, leading to widespread surface damage and corrosion of underlying material. The main cause of pitting in metal starts at small surface defects, such as an existing scratch, manufacturing defect, microscopic defects, or small change in composition naturally present in or on the material. Pitting in metal is more of a chemical process than a physical one, as negatively charged ions (anions) flow into the pitting area and remain there, creating extremely acidic conditions. This can create not only in a deeper pit, but the metal underneath can experience corrosion and decomposition. For concrete and masonry surfaces, pitting can also be caused by acidic solutions coming in contact with the material. The acids dissolve the minerals present in the concrete material, creating a rough surface as the concrete is dissolved and leaving aggregate more exposed. In colder climates, weather can also cause pitting as small water droplets can soak into small cracks and existing holes in the concrete. As the water freezes and thaws, the existing holes are widened. For swimming pools, metal surfaces with constant flow of water can be at risk for pitting. Metal pipes and pumps are the most common areas where pitting can form, as the continual water flow in these confined spaces can contribute to the pitting process. Pool concrete walls, floor, and coping can pit when repeatedly exposed to unbalanced pool water and too acidic. Pool water with low pH, low alkalinity, or low calcium hardness can create a condition where the water seeks to gain minerals, and will find these extra minerals first in the concrete, grout, stone, and masonry surfaces if the water is not promptly balanced. Clear and Balanced Pool Water All Summer With No Headaches! 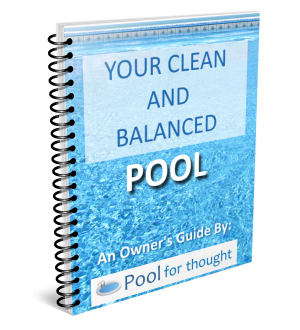 We're almost done making an eBook for pool owners like you that want an easy and straightforward guide to keep their pool water balanced and clear with as little work as possible. Enter your first name and email below and we'll let you know when it's ready! 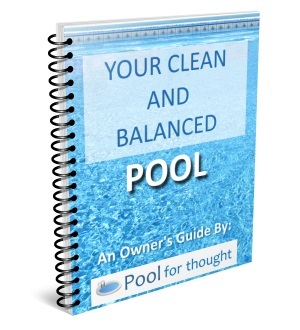 We're finishing up our easy and straightforward guide to help keep your pool water clean and balanced all season long. It's almost ready. So get on the list to know when it's done!